A broken or cracked tooth can be more than just an eyesore. It can cause sudden pain (especially when eating) or result in constant discomfort. A damaged tooth can also have more significant implications for the way the upper and lower teeth fit together when the patient bites down. Dental crowns are typically utilized at our Downers Grove practice in these cases. Dr. Sherif Albert places crowns over the damaged teeth to protect and support them, as well as restore the appearance of the smile. If you are experiencing pain from a broken or cracked tooth, contact the team at Esplanade Dental Care today to schedule an appointment to discuss the placement of a porcelain crown. A porcelain crown is a tooth-shaped covering that is placed over the surface of a damaged tooth to provide normal appearance and function. Crowns are made from tooth-colored material that is shaped to resemble natural teeth, making crowns virtually undetectable from surrounding teeth. 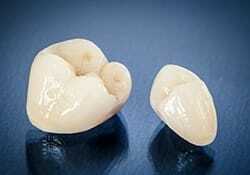 Crowns are commonly used to support single teeth but may also be used to hold a dental bridge in place. Crowns frequently top dental implant posts as well; when a tooth has fallen out or been extracted, a dental implant provides an excellent, stable base for the crown. The placement of porcelain crowns usually requires two office visits to Esplanade Dental Care. During the first, Dr. Albert removes the decayed area of the tooth and some additional structure to make room for the crown. He then captures impressions that are used to guide the fabrication of the crown at a dental laboratory. The crowns will be custom-crafted to fit the patient’s teeth and blend in flawlessly with the surrounding teeth’s color, shape, and size. While the custom restoration is being created, Dr. Albert may place a temporary crown so the patient can eat and speak normally. Once the custom crown is ready, the patient returns to our office to have it placed. This is usually about two to three weeks after the initial visit. The temporary crown is removed, and the custom crown is slipped over the tooth and bonded into place with a dental adhesive. The crown is buffed and polished to mimic the appearance of the surrounding, natural teeth, and Dr. Albert checks to make sure the bite lines up correctly. Porcelain crowns offer several benefits. They are crafted from only the finest materials, making them extremely durable and long-lasting (with the proper care). The porcelain material closely resembles natural tooth enamel, so the crowns will blend in seamlessly with the surrounding teeth. They also restore the patient’s ability to chew normally, although for optimal results, it’s best to avoid extremely sticky or tough foods. Crowns can save a tooth that otherwise may need to be extracted and replaced with a dental implant. Placing a crown is a much less invasive procedure than placing dental implant posts. Also, placing crowns can improve a bite that is thrown off by a missing or misshaped tooth. The placement of porcelain crowns can carry some risk, but when performed by an experienced dentist, these risks are decreased. Firstly, removing a small bit of tooth structure to accommodate the crown can result in slight sensitivity to hot and cold food and liquids. Also, if the crown is not finished properly and does not allow the jaw to rest in a balanced manner, the bite can be adversely affected. This will require some modifications to correct the way the upper and lower teeth come together. It’s also important that the tooth be properly sealed before the crown is placed; if not, the tooth could decay further. Over time, porcelain crowns may shift in place or become dislodged as the adhesive material holding it in place weakens. In these cases, the crown will need to be replaced. If you’re interested in the placement of porcelain crowns, please contact our Downers Grove office today. A friendly member of our office staff can schedule a personal consultation for you to discuss your needs with Dr. Albert and determine the best course of treatment.